Chicago Residence | can i just finish my waffle? 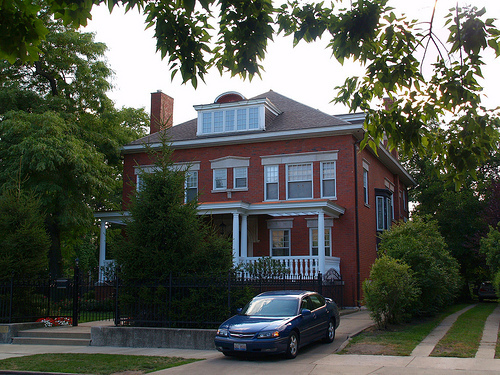 According to the Chicago Tribune, the Obamas will be keeping their home in the Chicago Kenwood neighborhood, the one they bought in 2005 for $1.65 million. The century-old dwelling comes with four fireplaces, Honduran mahogany and a wine cellar. During a brief outing to a South Loop deli the other day, the president-elect shook hands with diners and told one of them he isn’t planning to put the house on the market when he heads to Washington in January. Whatever Obama’s attachment to the home, there could be some upside for him in getting rid of it. The house is a reminder of Obama’s connection to convicted political fundraiser Antoin “Tony” Rezko, who bought a vacant lot next door and then sold part of that land to Obama in a deal that led to controversy on the campaign trail. Most of the neighbors seem to be taking the added security in stride. About 12 blocks are cordoned off with tight security. Some are hoping there might be an “Obama bump” in the real estate market in the Kenwood and adjoining Hyde Park neighborhoods.